I don’t think anyone has ever done a survey about how people find their way to the Shambhala path but I’m pretty sure that Pema Chödrön’s books were pointing the way for many of us—especially in the last ten years or so. 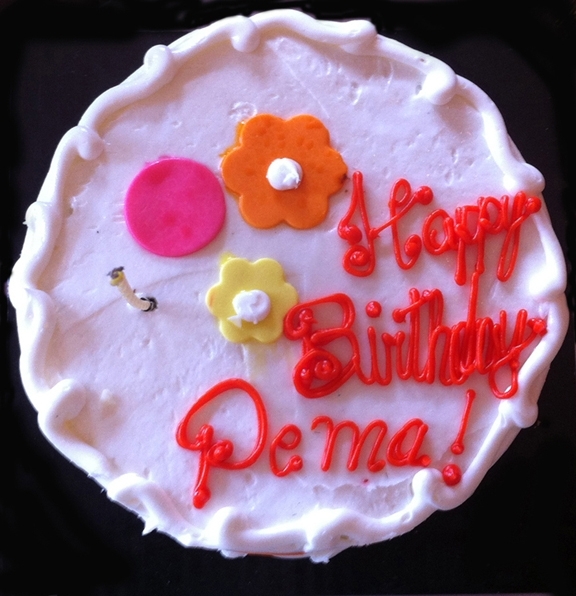 Saturday 14 July marked Pema Chödrön’s seventy-sixth birthday. Midway into a one-year solitary retreat in the Colorado mountains, and for the first time in all her decades of teaching, she asked her students worldwide to join her in a one-day retreat called “Practising Peace.” And so in Shambhala centres and living rooms from Iran to Uganda, people sat together or alone in practice. The sun gleamed on the hardwood floors; the altar flowers were cheerful with orange dahlias; and then there was cake! Participants gave $160 in offerings to the Pema Chödrön Foundation to support the nuns of Tsoknyi Gechak Ling.